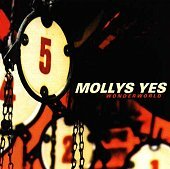 On their major label debut, Mollys Yes delivers pop-rock with an additional dance vibe thrown in for good measures. Their sound is rooted in a heavy 80's sensation, but the band also takes advantages of the modern wonders of digital programming and studio wizardry to create a sound that bridges the 80's and 90's. "Sugar," the first single, is a crunchy pop-rock number with sugary hooks certain to fill your cravings and make you crave more. "Promises," on the other hand, demonstrates the band's programming side as they slide some layered dance grooves into their pop-rock stew. They'll have you dancing, shaking, and sweating to the collision of dance beats and pop hooks. "Tell Me the Truth" is an updated new wave track; it takes typical modern rock and pushes it into a blender with some 80's radio staple sounds. Of course, "Hypnotic," another shining moment for the band, once again proves their ability to write a solid hook around a dance vibe you won't miss. Though the band often plays into cliched modern rock, their attention to distinction helps them stray away from the over-abundance of "heard it before" modern rock that so many of their contemporaries are falling prey too. The addition of the dance grooves helps lift them out, while their re-invention of 80's pop helps them too. Still, the lingering modern rock absorption is still there. All and all, a good record with some strong hooks you'll enjoy sinking your teeth into. I'll give the album a B-.